I've forgotten exactly where I heard about BenX, but it's taken some work to get my hands on it... and I'm glad I did. The film is in Belgian, without any subtitle options (on my copy at least) and so I resorted to opensubtitles.org to get me a copy that would allow me to understand what was being said in the film. The sub I did get my hands on was poor, some words were straight up not translated and oft times sentences made no sense in their structure, not to mention subtitles just missing for various things said, but it was still enough to be able to enjoy the film. 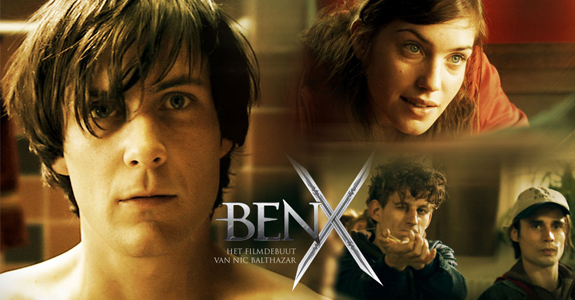 It's a 2007 film from Belgian film director Nic Balthazar (whom also wrote the book that the movie is based off - which just so happened to be based on a true story of similar events) which follows a high school student, Ben, whom struggles with bullies and people in general mostly due to his quirks brought on by his Asperger syndrome (a form of Autism). They show you Ben through out stages in his life, trying to live a normal life with going to school and the tribulations met with fellow students and even teachers not understanding how it is Ben learns and deals with life. Ben does not express himself through vocal means and instead stays silent, meticulously analyzing the small things in life; the way people's lips move, how their eyes express and so on, not being able to just take in the world as a whole idea. Ben has an escape, however, as he is able to better converse his thoughts and realize himself as a brave and heroic character in the MMO "ArchLord" (which is an actual MMO). In this world, everything makes sense to him and he references the ability to be whom ever you want in such a world instead of having to deal with your only option of "self" in the real world. More importantly, his entire time on the game from inception up until we meet him in the film (a level 80 character) he has paired up with a girl whom goes by the handle "Scarlite". His "Healer" and companion, the two bond greatly over the game and she plays a larger role later as the story progresses. But that's really all I'm going to say... because I pretty much knew that much going in and I was pleasantly surprised at how the entire rest of the film played out after the point I thought it might end. It wasn't a movie where I could pin the idea down as quickly as I thought I could and for that I adore it. It had me guessing a bit and I really enjoyed the character of Ben and his way of thinking. By the end of it, I had tears in my eyes and a smile on my face, as the credits rolled, I took a breath and decided to write this blog post. Check it out.